I’ve perfected a meaty beef roast—perfect for the Le Creuset, Staub, All-Clad, and other braisers. It’s a lovely beef roast with French onion sauce. 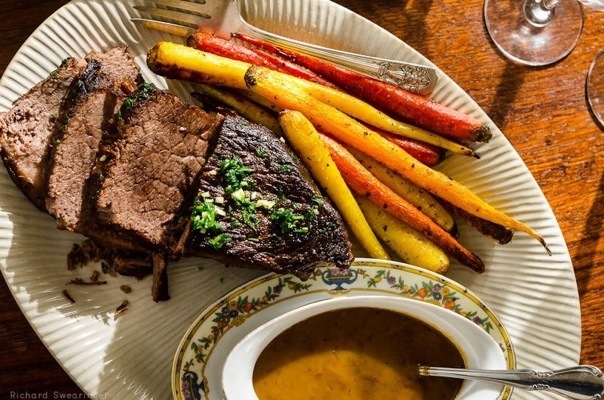 With this recipe, I’ve departed from the usual braising cuts I love the most—short ribs and chuck roasts, which come from the shoulder of the animal. Instead, I gave the round (the rump of the animal) a go, and went for a bottom round roast. I love this cut! While it doesn’t have the fatty, fork-tender succulence of short ribs and chuck roasts, it has an abundance of big, beefy flavor. Pour a little French onion sauce on it, and it’s heaven. Leftovers are amazing: I roughly chopped the leftover cooked meat in a food processor then stirred in some mustard, mayo, salt, pepper, and chopped sour pickles (cornichons, to be exact), for a fabulous beef salad sandwich. I’m dreaming of it now. Le Creuset braiser; please let me know the perfect size braiser I should order to augment my Le Creuset Bouillabaisse used for soups and stews. You can use the 3 1/2 quart braiser. If you use a larger braiser (the 5-quart) then just be sure to keep a keen eye on the liquid–you don’t want the pan to boil dry. Gravy or sauce? You use both words. Which is it, and what’s the difference? Great question, Rick–I’ll post an answer to this one in a separate blog post!